Today should have been Madeline’s first day of Kindergarten. Her late birthday would have put her in transitional kindergarten last year, but today would have been the big day. The pictures, the first time with a backpack, the whole shebang. Kindergarten is a huge milestone, and it’s another one that she is missing. I am focusing on Annabel starting school next week. I took her to the store and we picked out a lunch box, thermos, and a special first day dress and pair of shoes. I’ve poured over the pamphlets the school has sent us to make sure I’ll have everything she’ll need. She’s ready. This morning we are taking Annabel to meet her preschool teachers, and we’ll be passing the elementary school. I am prepared to see the parents of the kindergarteners giving their kids nervous hugs and kisses. I am prepared for it to really, really hurt. And then I am prepared to turn all of my energy toward Annabel and her special milestone, because not only does she deserve all the excitement and attention, but I deserve to be excited for her. This is another one of the many moments of balancing grief and happiness that I am going to have to deal with for the rest of my life. I think after we meet her teachers, I’ll take my girl out for breakfast. Something special, for the both of us. I’ll be thinking of you and sending lots of hugs your way! I’m sorry you have to put up with the balancing act but I think the way you handle it is admirable and awesome. Have a great day with Annie! I agree with Kristen: it’s horrific that you will always have this balancing act in your life. It shouldn’t be and it’s not fair. I’m so sorry for all the milestones you’ve missed with Maddie. Unspeakably sorry, I wish I had something more articulate to say. But I do also believe that you are an amazing mom to Annie and James and have accomplished so much in Maddie’s name since she passed and I too admire you. Love and hugs to you!! Thinking of you and sending lots of love Heather! I can completely relate to the balancing act of grief and happiness. I lost my mother seven years ago when I was a teenager, and I’ve felt really similar bittersweet mixtures of terrible grief at what should be my happiest moments — when I graduated valedictorian from my high school, when I went off to college, when I got engaged (though that, ahem, didn’t last) college graduation…I know I’ll feel the same on my wedding day, if and when I have my first child…It’s really hard to feel as happy as I know I “should” when all I can think about is how she is not here to share the moment with me. As a daughter who lost my mother when I was still, essentially, a child…I feel a connection to you as a mother who lost her child far too young. I think about you and Maddie often, and want to thank you and Mike so much for writing about your loss and sharing your feelings with the world. Amber, I’m so sorry for the loss of your mother. It is so sad at any age but especially when you are still so young. Wishing you, Heather, and everyone much peace and love. It is all so bittersweet. I will be thinking about you and Maddie and you and Annie extra today. I have written similar “additional information” to the twins teachers. The link above is to one of my posts about it (just in case any of my experiences will help you with yours). This made me weep. Wishing you a beautiful day. Thinking about you today and sending hugs! Tears here, tears at my desk. My Ava started a week ago. Sorry that you will have to pass the school and see the kids. Hope you try to make it a happy day. Even if it is soo bittersweet. Much love to your whole family today. I hope it’s a great day!! I will picture Maddy smiling at you all. I’ll be thinking of you & your girls today & sending tons of good vibes your way. I often ask myself how do people deal with the grief that you have to go through in your life, but by following your blog, I’ve learned a lot. You don’t have a choice, you just have to. I must say that you do a terrific job of this. Your balancing acts amaze me everyday! You are such a great mother, and human being! I wish you the best in everything you do & continue to think of you and say prayers for you, Mike and the kids everyday. Thinking about today. Sending much love and many hugs. I remember the day Emma should have started school. This year she would have started 5th grade. It is just absolutely crazy. I am so terribly sorry you are not sending Maddie off to kindergarten this year, and I wish you every happiness as you celebrate Annie’s big day. Thanks as always for sharing your experiences with your readers. You have such awareness and thoughtfulness about parenting your gorgeous kids. I hope you have peace and a sweet day as you pass this milestone for both of your girls. I got all choked up reading your comments you wrote in Annie’s school papers. It is so perfect. You do a great job with your children and I know it must be very hard. Such a beautiful, heartbreaking, tear-jerking and smile-inducing post. I mean this with all my heart — if I could be half the mom you are to your children, I would be one unbelievably grateful and happy momma! You inspire and pull out the goodness that dwells within each of us through your words, whether they be of pain, heartache or of joy and laughter – thank YOU! Your comment on the form seems perfect. I’m excited for Annie, she’ll have so many stories to tell. Sending hugs. Like the others, i think you are doing such a great job and Annie is just a darling girl with what seems to be a matching personality! All due to the love you and Mike give her! This in no way compares to what you are feeling, but my 15 year old daughter had what we can only explain as a nervous breakdown last year after her favorite teacher died suddenly. It was a long recovery for her just to function let alone go to school. I have been so sad these last few weeks seeing all the posts about back to school, knowing that she is still not well enough to go to school. She is doing independent study now which is great progress. I have to remind myself that 6 months ago she wasn’t able to even do homework and be grateful in the moment. You are doing this grateful/sad mixture every day and i really admire your ability to honor both. you are a shining example!! It’s good that you are able to stay focused and still feel and honor your little girl. My son’s birthday is coming up next week he would have been turning 29… It never really gets better, its been 3 1/2 years since he was killed….it seems like yesterday and too long since I’ve seen him. Stay strong and love your family! I am so excited for Annie to be starting preschool! I can’t wait to hear all the stories about how she is so well liked, well rounded, adjusted, and has the great imagination. Instead of being plugged into IPads, IPods, and computers, you’ve nurtured her creativity and fun. I know, as an educator, that your Annie will do great in preschool and she’s going to be bursting to tell you all about her first day when she gets home. Now the hard part – getting her to come back home the first day. My Tim didn’t want to. He said “Mom! Go back home and come get me at bed o’clock then I will sleep and come back.” LOL! Crazy lil’ kid. I was thinking of you this week as I watched students returning to our building and thinking that this was the time Maddie would be entering Kindy as well. My heart hurts that you won’t have that moment with Maddie but then it also bursts with joy at the adventure you’re embarking with Annie. Oh, I’m so sorry you are going through this. I hope you and Annie had a wonderful first day. Late to comment…I hope your day with Annie was special. It is such a grand and exciting time for her to be starting school and I hope she has a wonderful time. 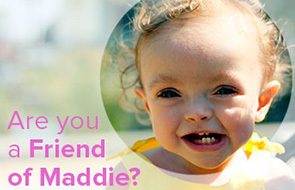 My girl’s birthday is just a few months after Maddie’s and I think of your beautiful baby often when I look at my daughter. You both had taught me so much…including how to love the color purple, I never was much into it before. Sending love and hugs to you all. You are SUCH an incredible mother. To all three of your beautiful children. Xoxoxox. My daughter was born at 29 weeks. She turned 6 yesterday, started Kinder on the 27th. I can’t imagine how hard the 28th was for you, and every day. James reminds me so much of Maddie!